Lending Club, a P2P loans community on Facebook, has launched a new website to expand its model beyond the social network. Lending Club’s members borrow and lend money from each other, taking banks out of the equation and lowering costs. It launched as a Facebook application in May and has since loaned out over $1m (£500k) to the social network’s members. Lenders decide on how much they are prepared to lend and the terms of the loan. Borrowers then choose a loan from the range of rates on offer. With this model, the risk for lenders is reduced by the fact that loans over a certain amount are spread across several different lenders, and loan applicants are credit checked. Lending Club has added several new features to its site, allowing users from the same workplaces, towns etc to connect with each other, adding better search options and a greater range of loan options. 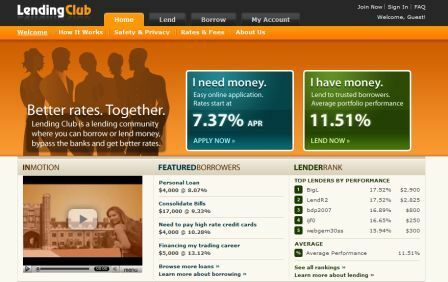 The social lending model is becoming more and more popular as an alternative to traditional methods. UK firm Zopa operates on a similar model and has around 150,000 members, around one third of which are lenders. Zopa recently launched its service in the US. We’re seeing some appalling behaviour from social networking wannabe Quechup, which is conducting a massive spam campaign on a scale not seen since the heady days of Dr Mariam Abacha. If trust is everything, then this is the sort of thing that can kill a brand. Quechup is potentially in a lot of trouble with its users, and legally it is skating on very thin ice. Almost a third of social network users say they have entered false information about themselves in order to protect their privacy, according to a new survey. The emedia report found almost two thirds of people that use sites like Facebook and MySpace say they have concerns about revealing personal details on the sites.